Sifu Wang Hai Jun was born in 1972 in Zhengzhou, Henan Province. At the age of 9 his father arranged for him to move to Chen Village to live and study with Grandmaster Chen Zhenglei, who is one of the “4 Golden Tigers” of Chen style Taiji. Each day before school he would train from 5 to 7.30am and after school he would train from 4 to 6pm. Frequently training again in the evening before going to bed. In the autumn of 1988 Master Wang Hai Jun gained entry to the Wuhan Physical Culture University, one of the top Universities of its kind in China. He competed successfully for his university in many competitions. After graduation Sifu Wang Hai Jun was assigned the post of coach of Pingdingshan Wushu Research and Study College. He is a senior state Wushu referee, the president and head coach of Zhengzhou Wushu Research and Study College, and coach of Henan Chen Zhenglei Taiji Culture co Ltd. He is an official lineage holder of Chen style Taiji (12th generation) and has been certified as 8th Duan in the Chinese National Wushu Association Duan Wei System. 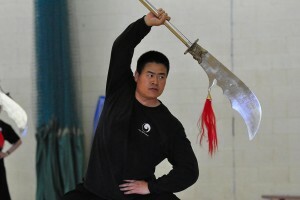 Sifu Wang moved to Manchester, England in 2001. He is enormously generous with his knowledge and teaches across England, Ireland, Europe and USA.